Being invited to commemorate these wonderful occasions is an honor, and you want to be sure to show your gratitude. But with so many choices, it can be hard to pick out a gift that feels perfect for the bride or mommy-to-be. You want it to be thoughtful without being overboard, and quality without being expensive. The marriage of a friend or family member is an exciting time. Help them celebrate by bringing a tasteful gift that they’ll remember. Checking the wedding registry for ideas if they have one is always a good go-to. According to a study by American Express, the average amount spent on a wedding gift by people who are invited to the wedding is $99, and $127 for family and friends. For wedding showers, a slightly lower amount is acceptable, so $25 to $75 is a good range to aim for, unless your gift is DIY. If you’re the hostess, you’re still expected to give a gift to the bride or groom to be. Sometimes the party theme indicates the types of gift you should bring. For example, if it’s a kitchen theme, consider a new set of steak knives or a picnic set. Choose a special date for the lucky couple, like the day they met or got engaged. 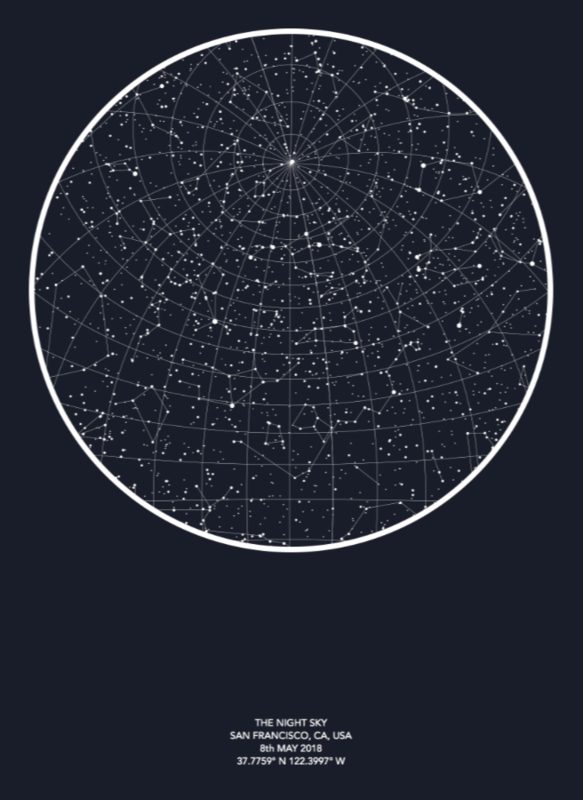 Once you know the date, let The Night Sky create a beautiful, one-of-a-kind map of where the stars were when the magical moment happened. You can add a special message at the bottom, like “4-12-14: When true love was born.” Chances are no one else at the shower will bring this gift, so there’s low-risk of duplication. Plus, it just may bring out some tears. Have the tissues ready! Planning a wedding can be fun, but no without its fair share of stress. Make sure the bride takes good care of herself during the process with these great ways to pamper. This classy pamper package is specially curated to sit a bride’s self-care needs. From a mineral body soak to delicious tea and beauty chocolates, this is a gift package with a unique twist that’s guaranteed to stand out. Feeling crafty? Add your own special touch by creating a gift of your own! You want the big day to go as smooth as possible. Help your loved one put their mind at ease by covering the little details in a wedding survival kit. It takes a village to raise a child. Let your loved one know you’re happy to be part of that village with a thoughtful gift. For a coworker or acquaintance, there’s no need to spend more than $25. Just as in a wedding shower, first check for a registry. Oftentimes parents with multiple children keep hand-me-down clothes and toys, so it’s better to buy refillable necessities like wipes and shampoo. Feel free to include a gift for the older brother/sister in the family who will be going through changes of their own. Every mother wants to do a baby book and other personalized crafts and items commemorating this momentous occasion. The problem? For most of us, it’s time. Help the new parents make the moment sentimental with this easy personalized gift. Anyone who’s had kids knows that half the battle of babyhood is keeping track of their pacifiers, especially when you need it most. 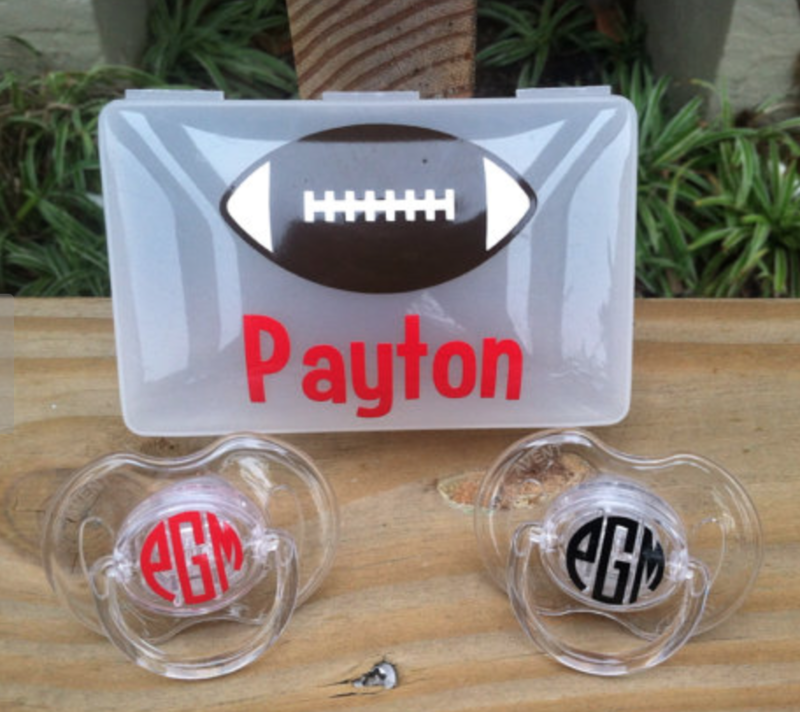 These monogrammed pacifiers are not only fun, but they come with a handy case to keep them clean and together. If there’s one thing new parents should typically prepare for, it’s sacrificing a bit of self-care. Get the new parents something they can treat themselves to during a few moments of downtime so they can be rejuvenated and ready for the next round of parenting. The Herbal Concepts HC Boot is perfect for the mom who doesn’t have time for a spa trip. Hot or cold therapy and a selection of 14 healing herbs wrapped around her feet will give her luxury on the go. Give the new parent and their little one something straight from the heart by making a gift yourself. Give a gift that will last forever and make for some great milestone photos with baby age blocks! Cut a wooden 4x4 into 2 3.5in x 3.5 in blocks, and one rectangular piece 7in long. Sand all surfaces until smoothe and round edges and corners. Apply words and numbers to the dried blocks using transfer tape.